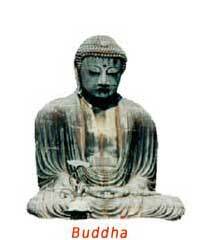 The Buddha was born approximately 563 B.C.E. as a prince in the northern part of the Indian subcontinent. It is said that although he lived a life of luxury, upon seeing the suffering of the world he left the palace to seek the key to ending suffering. After years of renunciate meditation practices, he at last achieved enlightenment and then began to share his realization with others. The Buddha taught the Four Noble Truths: 1. That worldly life is not perfect or satisfactory in itself; suffering is inevitable. 2. Suffering is caused by our desires. 3. There is a state in which there is no suffering. 4. There is an Eightfold Path by which to achieve this state. This path consists of right understanding, right thought, right speech, right action, right livelihood, right effort, right mindfulness, and right meditation. As one becomes detached from desires and gains full control over the treacherous mind, one can reach an egoless state of inner peace and bliss. The Buddha’s teachings spread widely, leading to regional and doctrinal variations. All, however, refer to the teachings of the Buddha, which were memorized during his lifetime by his monks and written down on palm leaves, forming a huge canon of scriptures. Although the Buddha emphasized personal detachment from worldly vicissitudes, his own life demonstrates that a key Buddhist virtue is compassion for the sufferings of others and desire to help free them from suffering.